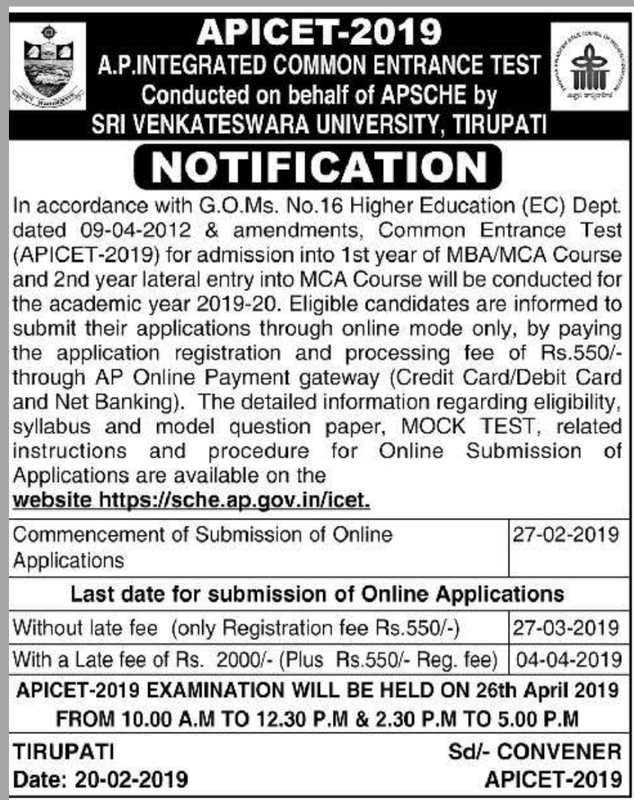 Andhra Pradesh State Council Of Higher Education in association with the Sri Venkateswara University notified the AP ICET Notification 2019 For providing the Higher Education For the Graduates into MBA and MCA in Andhra State the aspirants need to register for the AP Integrated Common Entrance Test 2019 Notification through sche.ap.gov.in/icet in Online From 27th February 2019 and the Exam Will be conducted for the students in various Centres of Andhra Pradesh on 26th April 2019. AP ICET Notification 2019 Released!!!! Latest Update On (26th February 2019): AP ICET Notification 2019 Released!!!! Check the Links in the below section of this page. Andhra Pradesh ICET 2019 Notification: SV University announced the AP ICET 2019 Notification on behalf of the Andhra Pradesh State Higher Education Council on 27th February 2019. So, Degree/ Graduate Holders who seeking for their Masters in Andhra Reputed and Other Colleges for the MBA (02 Yrs) and MCA(03 Yrs) and MCA (Lateral Entry) Courses need to check the Notification which is given here clearly on the site Jobschat.in. In addition to the Details, we also informed the Model Papers, Syllabus and Mock test for the Candidates to know the ICET Exam Pattern here. All the Employable Aspirants must apply for this in Online during March 2019. Those who qualify for this AP ICET Entrance Exam only can take part in the Counselling and can give the options for their Choice of Colleges. Coming to the AP ICET 2019 Entrance Notification, Both the Degree and Bachelors Degree can apply for this to get entry into both MBA and MCA Fields. But, the aspirants need to apply for this in Online by paying a fee of Rs.550/- without any late on or before the Last Date by checking the sche.ap.gov.in/icet Notification 2019. The Sri Venkateswara University is conducting the Andhra ICET Exam for the year 2019. It also issued the complete information here and the aspirants need to apply and can go through the Model Papers in order to face the Exam which is conducted on 26.04.2019 in all Districts of AP. And the Candidates who are appearing for the Competitive exams also apply for this as the exam is conducted similarly to Government Jobs. Candidates who want to opt their Higher Education after Degree/ Engineering into MBA/ MCA must possess the Stipulations that are informed here i.e similar to the AP Integrated Common Entrance Notification 2019 and direct entry is provided for 1st year MBA and 02nd Year MCA. For MBA: Must have a Graduate Degree/ Degree(03 Years) in any discipline and must also possess Mathematics as one of Subject in Mathematics. For MCA: Must have a Graduate Degree/ Degree(03 Years) in any discipline with 55% of marks. Final Year Pursuing Aspirants can also apply for this APICET 2019 Notification. Candidates applying for the Andhra Pradesh ICET 2019 Notification must have the age limits minimum of 20 years and maximum as per the notification. All the Candidates who want to apply for AP ICET 2019 Notification must pay a Non-Refundable Fee of Rs.550/- before the due date in Online mode and With a late fee of Rs.2,000/- and Reg Fee Rs.550/- before the last date. Candidates get Entry into MBA and MCA Courses in their choice of Colleges in Andhra Pradesh based on the Online Written Test and Counselling Centres. First, select the AP ICET 2019 Tab and open the AP Integrated Common Entrance Test 2019 Notification information tab and Read it carefully by downloading it. Then on Homepage find the Fill Application Form link available. Start the Application process with the help of applying link and fill the required columns by adding the required documents. Also, pay the fee, Recheck the application and submit in Online. Take a Hard Copy of it and use it for future correspondence. AP ICET Online Application 2019 is available on sche.ap.gov.in/icet to apply and the Final Year Degree/ B.Tech Contenders can apply for this from February/ March 2019 onwards and for the applied candidates only the Examination is held by issuing the Hall Tickets also here. And SU University conducts the Counselling centers and based on the Score Achieved by Graduates the Seat allotment is done. Because some of the candidates write it for getting a good seat in Top colleges and some for obtaining the Reimbursement. So, the contenders also visit the Jobschat.in site after the Examination to check the ICET Results, Rank Cards and Counselling dates also.